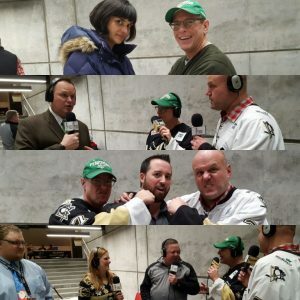 Our first podcast road trip… from WesBanco Arena and the Wheeling Nailers game with some stocking stuffer chit-chat just before the game against Cincinnati. Guests: Sarah Aziz from the Pittsburgh Cultural Trust with First Night updates and prizes, Wheeling Nailers Coach (former Pens player) Jeff Christian, West Virginia House of Delegates Rep. Shawn Fluharty, and then Kelly Clutter (VP of Marketing, Wheeling Nailers, Brian Stefan (Co-owner of Sports Monger and Marketing Media) and Andrew Grimm (Hockey writer for Sports Monger) join us for stocking-stuffer chat! LISTEN to the Podcast show below or on iTunes, Apple Podcasts, Google Play Music, Stitcher Radio, Soundcloud, Overcast, Pocket Casts, and Tunein Radio via the “Pittsburgh Podcast Network” channel. Top to Bottom: Pittsburgh Cultural Trust’s Sarah Aziz and John Chamberlin before the show; John & Craig talk to Nailers Head Coach & former Penguin Jeff Christian; John & Craig goof off with Shawn Fluharty, member of the WV House of Delegates; John & Craig with Brain Stefan & Andrew Grimm of Sports Monger and Kelly Clutter, Nailers VP of Marketing. 01:09 Wayne Weil packed up the podcast gear and we hit the road! We are in the lobby of WesBanco Arena just before the Nailers game against the Cincinnati Cyclones. You won’t hear it on the podcast but, between periods 1 and 2 we went on the ice to judge the ugly sweater contest! Everyone tells a stocking stuffer story! 12:43 The head coach of the Wheeling Nailers, Jeff Christian, has a stocking stuffer story, great chat about his friendship with Bill Guerin and his tips for Craig’s boys playing knee hockey at home! 24:05 West Virginia Delegate, Shawn Fluharty joins us. Shawn has an awesome vision for growth in the Wheeling area AND bought us a beer (which Craig spilled). 34:01 Kelly Clutter, Brian Stefan and Andrew Grimm (our gracious hosts and connections to nachos and beer) have stocking stuffer stories. You can hear Andrew’s tie sing! Big thanks to the Wheeling Nailers organization and Sports Monger (Did You See That Now) for having us and actually allowing us in the building! Definitely make a point to go see some Wheeling Nailers games! See Andrew’s write-up about the game here. – ALL users can listen on computers, tablets, and smartphones via RSS, SoundCloud, Stitcher Radio, Overcast, Pocket Casts or tune in radio, website or apps.